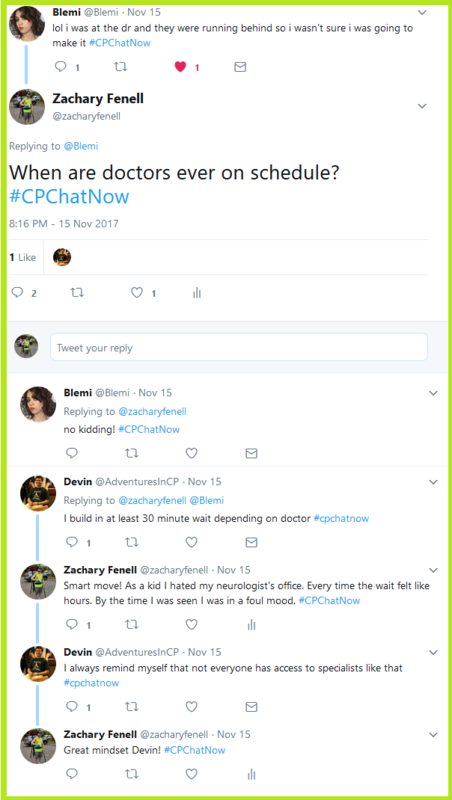 Participants in the live cerebral palsy Twitter chat #CPChatNow enjoyed thought provoking conversation Wednesday, November 15th, 2017. I am co-host Zachary Fenell, here to capture the riveting dialogue and allow you to further contemplate the various topics discussed. My co-host Devin Axtman provoked thought early as Blemi and I discussed wait times at the doctor. While Blemi and I joked about untimely doctors, Devin supplied helpful advice and perspective. He plans at least a 30-minute wait into his schedule when he sees the doctor. When waits grow irritatingly long, Devin reminds himself not everyone possesses access to such specialists. What a great mindset! Dreams emerged another popular topic during the chat November 15th. Seth wondered why so many guys with CP watch wrestling. 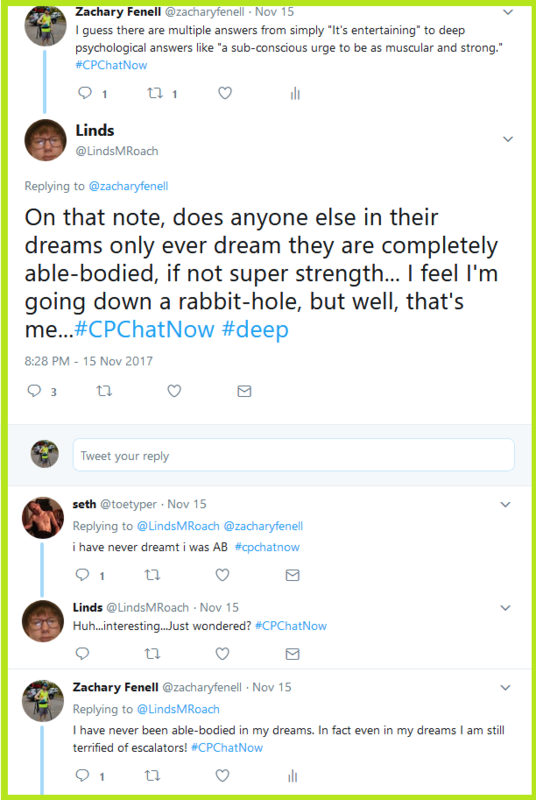 In my response I suggested a possible “sub-conscious urge to be as muscular and strong.” That idea led Linds to transition the topic to dreams. Linds asked if anyone else ends up in their dreams either able-bodied or possessing super strength. Both Seth and I never experienced those abilities in our dreams, but what about you? 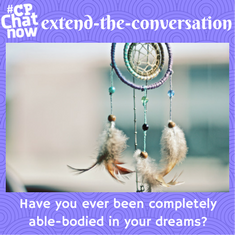 Answer for the week’s extend-the-conversation question, “Have you ever been completely able-bodied in your dreams?” Leave your response in the “Comments” section! Moving on Shira Sadiky joined in the chat expressing her dislike for the term “special needs.” People within our community held passionate opinions regarding the term. Empathizing Devin referenced the disability rights movement rally cry “Nothing about us without us.” The fact people make decisions regarding disabilities without talking to those with disabilities sickens Shira. 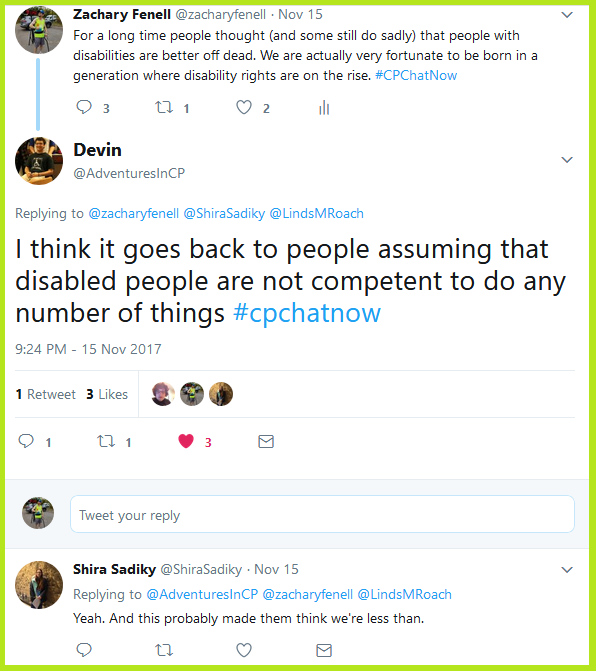 I helped place context to the situation explaining how only decades ago many thought death offers a better fate than living with a disability. Said point hit home with Blemi. Blemi recalled as a little girl telling her father she wished she was never born. Remembering the comment saddened Blemi. 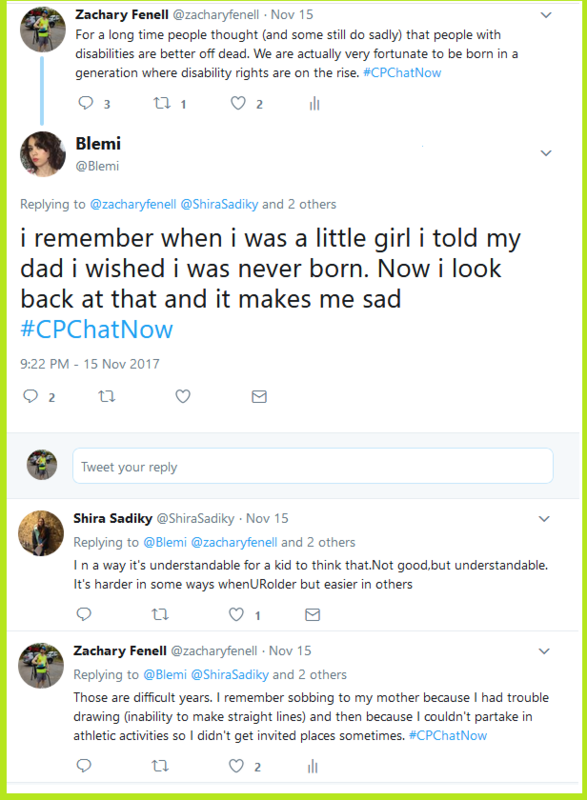 Shira and I however understood the difficulty and why little girl Blemi would say what she said. Meanwhile Devin analyzed the potential reasoning behind the “Better dead than living with a disability” mentality. Assumptions people with disabilities cannot do many tasks Devin believes powers the “better dead than living with a disability” attitude. Any incompetent assumptions get destroyed by looking at our #CPChatNow recap archives. Our community showcases thriving possibilities and will continue doing so. That leads to a couple community specific discussions. 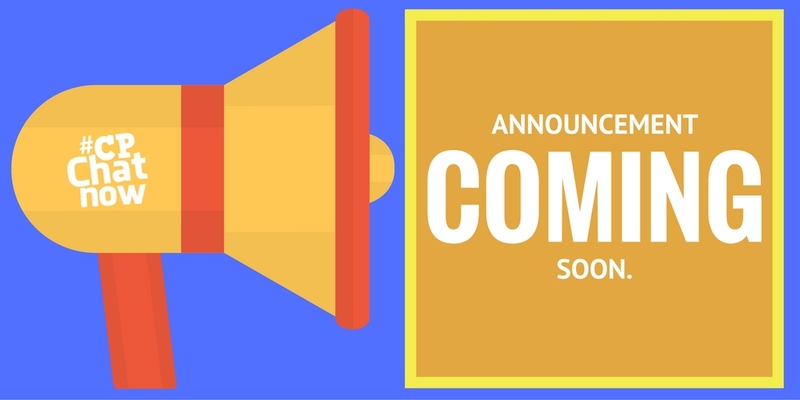 First, Devin announced our November 2017 Google Hangout date. Hopefully you join us for our video chat via Google Hangouts Thursday, November 30th, 2017. We do not share the link publicly for privacy reasons. 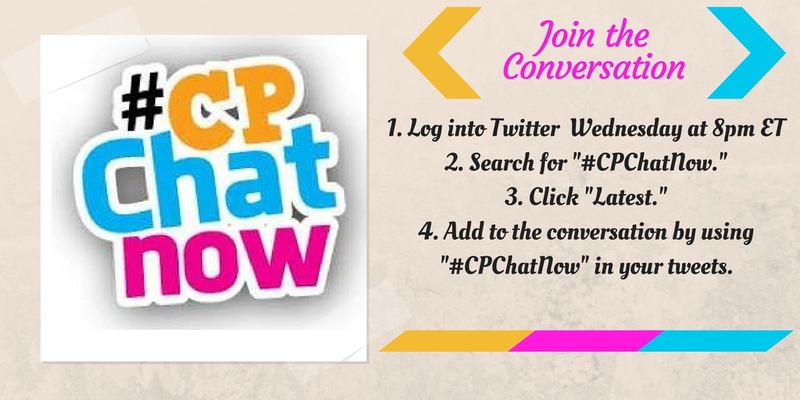 So if you wish to join us, message the #CPChatNow Facebook fan page. Secondly, #CPChatNow also stands ready to start planning a new shirt sale. Initial steps involves collecting design ideas. Time to speak up on what you want to see in the next #CPChatNow gear. 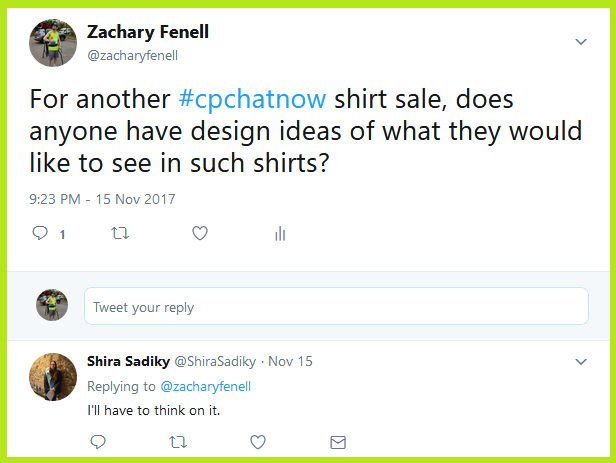 Think like Shira and let us co-hosts Devin, Jorge Otezia, and I know your design ideas for the next #CPChatNow shirt. Before sharing your shirt ideas with us though, remember the extend-the-conversation question awaiting your response. Respond below in the “Comments.” If yes, please give some details.